On Be Yourself Tonight, Eurythmics' most commercially successful and hit-laden album, the duo meticulously blended the new wave electronic elements that dominated their previous sets with the harder straight-edged rock and soul that would dominate later sets to come up with a near-perfect pop album. This disc scored no less than four hit singles and kept them a mainstay on MTV's play lists during the channel's heyday. Fusing pop, soul, rock, electronic beats, and even gospel, this is arguably the duo's finest moment. The first hit, "Would I Lie to You," is a straight-forward rocker, complete with great guitar licks, a soulful horn section, and Annie Lennox sounding as vicious and vivacious as ever. The second single, which was a huge chart topper in Europe, "There Must Be an Angel," is nothing short of shimmering beauty, with Lennox providing truly angelic vocals and Stevie Wonder lending an enchanting harmonica solo. Aretha Franklin lends her powerhouse pipes for the duet "Sisters Are Doin' It for Themselves," which has gone on to become an immortal feminist anthem. From the soulful electronic beats (a rarity) in "It's Alright (Baby's Coming Back)" to the beauty of the Elvis Costello duet "Adrian" to the pain and longing of the sorrowful rocker "Better to Have Lost in Love (Than Never to Have Loved at All)," this album runs a wide array of musical styles, each song standing tall on its own two feet. 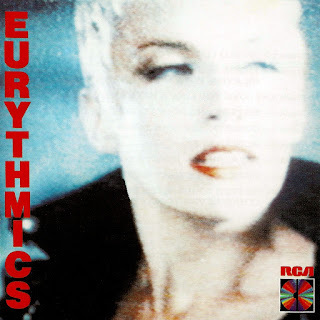 This disc is, without a doubt, one of the best rock/pop albums from the 1980s and one of the grandest, most creative albums delivered by the ever-appealing and innovative duo of Annie Lennox and Dave Stewart. A true classic.